We may be tea geeks, but we’re not against adding milk to our tea now and then. Having recently discovered what our CEO called the “Mercedes of Tea Frothers”, we are now enthusiastically whipping up tea lattes. So we’re devoting this blog to sharing how you too can create cafe-grade lattes at home, without splurging on an espresso machine with a steamer. Here are some other supplies you’ll find helpful. - A milk pitcher or measuring cup, or a deep mug can work nicely. - A way to heat your milk – either by stove top in a saucepan or by microwave in a safe container. - Good, high quality tea - duh. We don’t have to tell you. - Milk, of course. Whole, skim, half-and-half, soy, almond, oat (yeah it’s a thing), cashew - it’s your choice. Let it be said that the type of milk used will affect the type of foam formed. If you see a “Barista” version of your milk alternative, go with that. - Dishcloth or apron. This can get messy. Be ready for a bit of spray if your mug is too full, or not deep enough. Now that you are all set up, let’s get started. Step 1: Heat milk in microwave-safe milk pitcher or measuring cup (or tall mug) for 60-90 seconds so it’s warm, not boiling. Or heat on the stove in a saucepan over medium heat, stirring occasionally; then remove from heat once simmering and pour into pitcher or mug. Step 2: Take your hand-held milk frother and submerge whisk just below the top of the milk, then press the power button. Step 3: Move frother upwards so that the whisk is half in the milk and half in the air for a couple of seconds to aerate the milk, and then submerge whisk fully, about half way down, never touching the bottom. Step 4: Slant the milk pitcher and the frother slightly, about 25 degrees. Step 5: Move frother slightly off from center and move up and down a bit, but staying away from the bottom of mug and top of milk. Step 6: Stop frothing when large bubbles start to disappear. The whole frothing business should take less than 30 seconds. Step 7: Pour beautiful micro-foam and milk over brewed tea. We recommend adding frothed milk to English Breakfast or Assam tea, Earl Grey, Chai, Matcha green tea, Organic Chamomile or Rooibos and sweetening to taste for a simple tea latte. You will need to adjust the amounts of tea vs. milk based on how big your mug is, and how frothy or not you want your latte. It may take a couple of tries to get to your perfect cuppa. A good place to start is ½ a mug of tea to ½ milk/froth. Since you’re practically a pro barista now...here are some upgrades and fancier recipes you may want to try. - Steep 1 Two Leaves and a Bud Earl Grey Tea Sachet in ½ mug of boiling water for 5 minutes, then remove sachet. - Stir in cane sugar or simple syrup to taste. - In separate container, heat milk. - Add 1/4 tsp vanilla extract to milk and stir. - Froth milk like a pro and pour over fully steeped Earl Grey tea to fill mug. - Steep 1 Paisley Label Chai Tea Bag for 5 minutes in ½ mug of boiling water, then remove teabag. - Add 1 tsp of vanilla and 1 tbsp of maple syrup to milk and stir. - Froth milk like a pro and pour over fully steeped Chai tea to fill mug. - Sprinkle with a pinch of cinnamon. - Place 1 tbsp of Two Leaves and a Bud Nice Matcha green tea powder in the bottom of your mug. - In a separate container heat milk. - Add a splash of heated milk to matcha and use a whisk to stir the matcha into a starter paste so that all clumps are dissolved. - Froth the remainder of the milk and pour over matcha starter paste to fill mug. - Give it a quick stir and sprinkle a dusting of matcha powder on top. - Steep 1 Two Leaves and a Bud African Sunset Sachet in ½ mug of boiling water for 5 minutes, then remove sachet. - In separate container, heat milk + 1 tsp of coconut oil. - Add 1 tsp of honey and ¼ tsp vanilla extract and stir. - Froth the milk mixture to perfection and pour over fully brewed African Sunset tea to fill mug. - Sprinkle with cinnamon and nutmeg. - Remove from heat and allow rose petals to steep for 15 minutes. - Strain through a fine mesh sieve. - You may need to re-heat milk. - Steep 2 Two Leaves and a Bud Chamomile sachets in ½ mug of boiling water for 3 minutes, then remove sachets. - Froth milk and rose mixture and pour over Chamomile tea to fill mug. - Sprinkle a pinch of rose petals on top. Brine that bird with tea! You guys. You guys! What kind of tea company would we be if we didn't acknowledge that it's Thanksgiving week, and NOT give you a recipe that involves both tea and turkey? Not a very thoughtful one, that's for sure. So in case you don't have a turkey recipe squared away for Thursday, we'll give you a recipe, and just say that you could use our sachets of Organic Earl Grey whole leaf sachets for this or, for a couple of bucks less, our Organic Earl Grey Paisley Label tea in traditional teabags would brew up fast and strong. Recipe success! 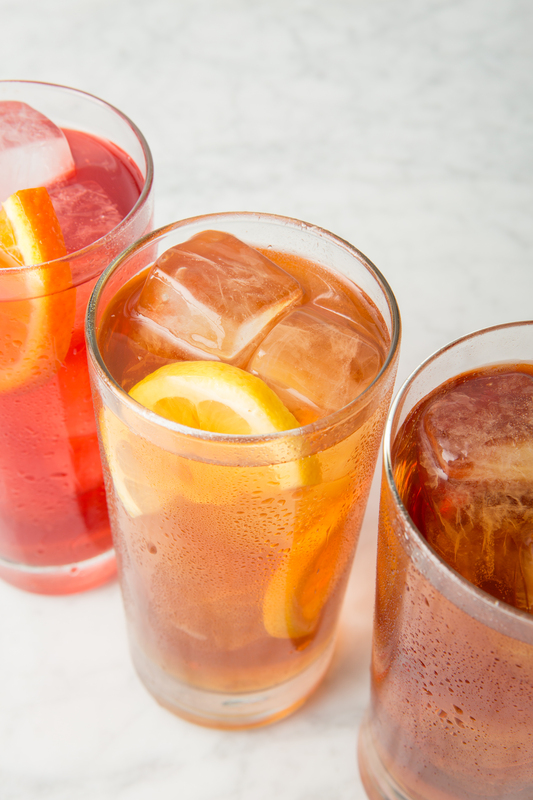 It’s iced tea season … say cheese! June is iced tea month, and while we love clever iced tea recipes and cocktails, we also love the unexpected ... like pairing iced tea with cheese! Pair our Organic Gen Mai Cha with Le Marechal, a cow's milk Swiss cheese with a savory and somewhat herbal flavor (because dried herbs are rubbed onto the wheel of this cheese as it ages). Pair our Jasmine Petal Green with a Cabra Blanca, a semi soft, silky and tender goat cheese with a subtle aroma, slight sweetness balanced with delicate tartness. We love Avalanche Cheese Co.'s Cabra Blanca, a cheese company based here in the Roaring Fork Valley of Colorado! Pair our Organic Assam Breakfast or Organic Paisley English Breakfast with high butterfat cheeses, that will stand up to these tannic teas. Gouda would work well! A strong tea like our loose Lapsang Souchong is perfect for pairing with a cheese with big flavor, like white Stilton. Think of how you might serve a creamy cheese with dried cherries to guests, and then pair our Alpine Berry or Organic Paisley Tart Berry with soft bloomy-rind cheeses like Camembert. Baking with tea! It’s our recipe of the month. Most of us at two leaves and a bud love cooking, and all of us love eating. And since we also love tea, we're blending these passions and sharing them with you in the form of a monthly blog post featuring a recipe that uses two leaves and a bud tea as an ingredient. Last month, we cooked pork with Mountain High Chai. This month, it's cookies with Earl Grey. It was recently my turn to bring dessert to book club, so I tested this recipe out on my friends. There were no complaints (that would be very unlike my book club! ), but the consensus was that the cookies were tasty with a subtle, but pleasant tea flavor. 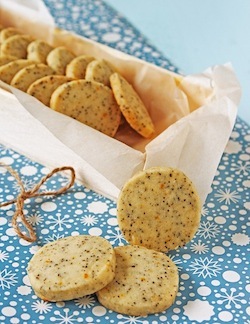 These cookies would also be perfect for a tea party and would make a lovely holiday cookie. I found the recipe on a wonderful blog called I'll Have What She's Having by a Montrealer named Lynn. Turns out she found the recipe from none other than Martha Stewart. I took Lynn's advice and tried cutting the amount of orange zest called for in half so as not to overpower the tea. Two leaves CEO Richard Rosenfeld also found the tea flavor in the cookies to be subtle. His recommendation for those of you that can plan in advance: let the tea "steep" in the (dry) sugar first. Put the sugar and tea in a jar together for a few days and see if the sugar absorbs some of the Earl Grey flavor. Maybe leave the sachets intact in the jar, so that you can separate them before you begin baking. If you give this a try, please let us know how it goes! Another tip: grind the tea with your fingers while it's still in the sachet and sleeve if you don't have an electric coffee grinder or food processor. Happy baking! And please offer your reviews and share your tea recipes with us. We'd love to hear from you. 2 tbsp finely ground Earl Grey (from about 6-7 two leaves sachets) Tea can be ground in a spice grinder or mini food processor. In a small bowl mix the flour, tea and salt together. Set aside. In a large bowl, beat the butter, powdered sugar and orange zest together with an electric mixer until the butter is light and fluffy (about 3 minutes). Add the flour, mixing until well combined. Split the dough in half and create two round logs, 1 1/4 inches in diameter, wrap them with parchment paper and refrigerate for 1 hour. To keep the bottoms of the logs from flattening out you can slide the logs into paper towel tubes before refrigerating. Preheat the oven to 350. Line two cookie sheets with parchment, set aside. Cut the logs into 1/4 inch slices, place the slices on the baking sheets about 1 inch apart. Bake for 13 to 15 minutes until the bottoms are just golden. Let the cookies cool on a wire rack before serving. Same tea, same time, every day? 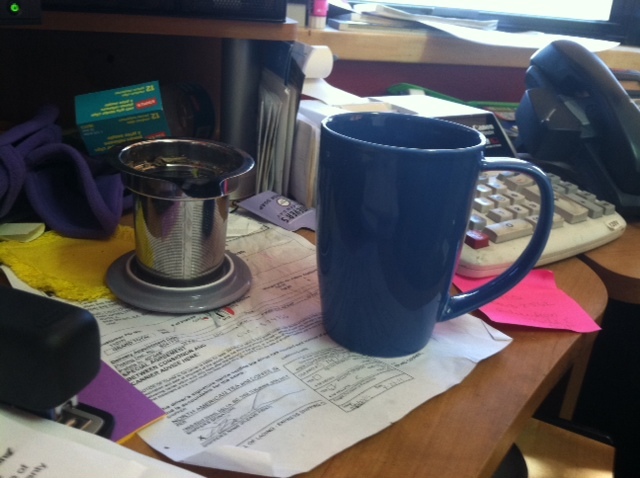 Our comptroller, Gigi, needs to drink loose leaf tea out of a mug with a different colored top every morning. Raise your hand if you think you have a tea habit. If you’re reading this blog, chances are you have a hand in the air, and that’s good. The dictionary defines “habit” as “an acquired behavior pattern regularly followed until it has become almost involuntary,” like looking both ways before you cross the street. But having this kind of tea “habit” conjures up images of reaching for a mug, a sachet and the electric kettle like a robot, with all the emotion of scratching your nose. Richard Rosenfeld, Founder and CEO: Assam every morning. I will confess that I "doctor" mine a bit with conventional (non-organic) Assams that I get from different gardens. Afternoons have been in transition for me: I have started to drink our new African Sunset. I like how the lemon balm and peppermint now balance out the rooibos flavor. I never have been much of a rooibos guy, but this one really is growing on me. Bess Hammer, Brand Ambassador: I drink 1-2 cups of strongly brewed, loose Assam at home with agave or honey and milk — one while getting ready and the other, if there is time, for the half-hour car ride, and then usually a cup of straight up Assam at the office. If I drink tea in the afternoon, I drink Tamayokucha, Jasmine, Darjeeling or Chai. Dena Albright, Purchasing: I usually start my day with one or two cups of green tea lke Tamayokucha, with no additives. Around 2 p.m. I have a cup or two of Mountain High Chai, again with nothing added, to boost me through the afternoon slump. Jennifer Okeson, Sales and Support: First thought in the morning (early morning, like 4 a.m.): “Yummm, Assam.” Plain. Nothing added. The rest of the day is fairly random tea-wise, but I always start with Assam. Allison Hill, West Coast Regional Sales Manager: Every morning immediately after getting out of bed, I put on the electric kettle and make myself a "double Assam." That is two Assam sachets in a 20 oz. cup of hot water with a heaping teaspoon of honey and a splash of unsweetened vanilla almond milk. I drink this all morning until around 11 a.m. when I try to get in my water for the rest of the day. At bedtime, it is a good book and a cup of Better Rest, straight up … no additions, no adulterations, just a good cuppa' Better Rest tea. 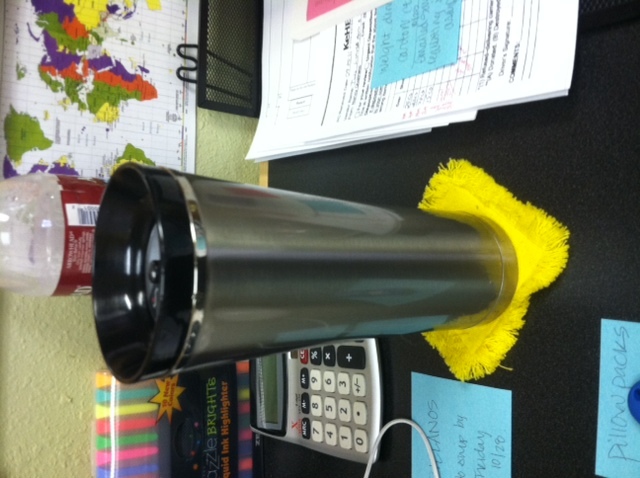 Customer Care Associate Lindsay Winkler says she's addicted to tea from this mug, which keeps her tea warm ALL day. Christy Garfield, Marketing Coordinator: I am an equal opportunity tea drinker. I start my morning with a different tea every day. Sometimes black, sometimes green and often herbal. On mornings that I wake up really thirsty, I crave rooibos tea (red tea) since it is so hydrating. I take my tea very hot, not too strong, and rarely with anything in it. I have always been an all-day, every-season tea drinker, so I am grateful to work somewhere that feeds my habit! Do you have a tea habit? We want to read about it, so chime in!